Samodivi – Witches of Darkness or Thracian Goddesses? Veelas, Wilis, Yuda, Samovili, Vili. These are a few names of nymphs of Slavic folklore, each group a little different from the Bulgarian Samodivi. Are they real or merely myths that have survived throughout the centuries? Who are these creatures? Where did they come from? And why do people fear them so much they are willing to leave their homes and move to another village or town? Let’s start with their name. Samo (alone) and diva (wild), so “Wild alone” or “Wildalone.” What exactly does that imply? First off, although diva describes them as wild creatures, the word also comes from divine. In fact, it has been said the Samodivi were daughters of the Thracian goddess Bendis. What samo signifies is they shun interaction with people. When humans come across a Samodiva, the nymph may harm them or befriend them, depending on her mood. Being the daughters of Bendis (often associated with Artemis, the Greek goddess who was a protectress of nature), Samodivi have a special connection with nature and have the power to heal using herbs, and so their role is to protect the forests and its inhabitants. They are a symbol of the coming spring, the awakening of nature. Each year on Blagovets, March 25, they return from their secret winter village in Zmeykovo (Dragon Village) to the human world and go back to their own world in late fall. These nymphs are renowned for their beauty, power, and magical seductive voices. Described as blonde women with long, curly hair, they are enchanting mythological creatures who have been portrayed for centuries in Bulgarian folklore—in fairy tales, poems, and legends passed from one generation to another. Numerous legends about them are still alive, and people in Bulgaria claim to still see them in forests and near water bodies. Most often their eyes are bright and light blue (although sometimes green). People with blue eyes have long been attributed with being able to connect to the spiritual world and cast the “evil eye” to harm others. Samodivi wear white robes made out of moon beams along with a green, golden, or rainbow-colored belt. A wreath of wild flowers adorns their heads and it, along with their clothing, is a source of healing and magical power. The Samodivi carefully guard their clothing so men cannot steal them. Sometimes they are careless when they bathe, and a man captures her source of power, forcing the Samodiva to live with the man and have his children, until she finds the stolen garment and escapes. On occasion, Samodivi choose to associate with humans. They befriend women who have been kind to them and teach these women how to use nature to heal. A Samodiva may also willingly marry a man and have his children. Those offspring become legendary heroes. Then why are people afraid of Samodivi? One reason is because Samodivi love to perform the horo circle dance under the moon in forest glades. Better yet they prefer it if the dancing is accompanied by the music of the kaval, or shepherd’s pipe. In many tales, they seduce and kidnap a shepherd to play for them. In some ways, Samodivi are similar to the “Dames Blanches” (White Ladies), Fées from French mythology and folklore who also live near caves and caverns. La Dame d’Apringy from Normandy is one well-known Dame who forced humans to dance with her before she allowed them to pass through a ravine she lurked by. Anyone refusing to participate was thrown into the thistles, while those who danced were unharmed. In a similar fashion, Samodivi entice people who disturb their dance to join in with them until dawn breaks. Humans are unable to keep up with the wild, fast pace of the Samodivi, and die from exhaustion. Or according to some tales, the Samodivi take the fallen person’s eyes and heart. People in remote villages still believe that trespassing on a Samodiva’s special places will cause them harm, even blindness. Samodivi cause havoc in other ways as well. In remote villages, people pay respect to them and are afraid of these creatures who can seduce men with their beautiful songs. In Bulgaria, small villages have been deserted, locals afraid of the powers of the nymphs. Stories circulate about a man who was found dead in the woods, murdered and left naked. The common belief is that this was done by Samodivi. People see flashes of white among the trees and claim they are the Samodivi. In another story, the mysterious disappearance of men has often been attributed to them being captured by Samodivi. A story tells of a village where five men disappeared. Two were eventually found, but they had no recollection of what happened. Samodivi and their world are portrayed in Mystical Emona: Soul’s Journey as close as possible to the way legends describe them. The excerpt below will help you envision them as they dance beneath a full moon. The existence of Samodivi (Wildalone) has not been proven and may never be. Sightings of them may simply represent fear and respect of the unknown and of nature. When we don’t understand something, we call it magic, witchcraft, or evil, but in reality, it’s an issue we don’t want to face. Author Ronesa AveelaPosted on May 22, 2015 February 18, 2019 Categories Bulgaria, History, Mythology and FolkloreTags Bendis, samodivi, ThraciansLeave a comment on Samodivi – Witches of Darkness or Thracian Goddesses? Ancient Thracian culture reveals splendor at Louvre (France). Exquisitely crafted gold, silver and bronze objects are on display at the Louvre Museum in Paris, giving visitors a rare glimpse of the ancient Thracian culture that produced them. Many stories still remain untold about this refined civilization whose citizens included Orpheus, the mythical son of a Thracian king, and the legendary gladiator Spartacus, who led an uprising against Rome. “Ancient Thrace is most famous for its unique goldsmithing works,” Bulgarian exhibition commissioner Milena Tonkova told AFP ahead of the opening last week. One of the exhibition highlights is the Panagyurishte ritual beverage set, the most prized possession of these ancient people who lived from the 2nd millennium B.C. to the 3rd century A.D in the Balkan Peninsula. The Louvre Displays Ancient Treasures of the Thracian Empire – Who are the Thracians? “The Saga of the Thracian Kings,” an exhibition now on view at the Louvre in Paris. 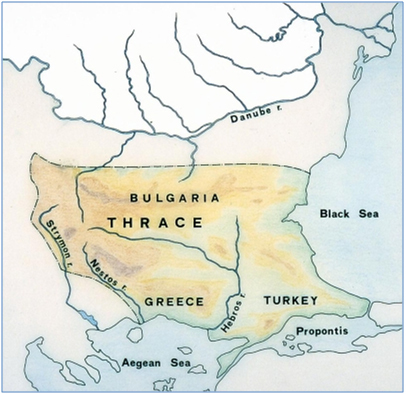 Who are the Thracians and where is the Thracian Empire? “Who were the Thracians?” poses a more difficult question. What we can tell you is that they have been around for a long time. Since the people themselves did not have a written language, everything that is known about them comes from other sources. The first historical reference to them was in Homer’s Iliad, where it was mentioned that they were allies to the Trojans. But evidence of them as a distinct people exists as far back as 1500 BC. A polytheistic people, they worshiped the Sun and Moon. Bendis, called the Great Goddess, was one of their primary deities. Better known, however, is Dionysus, the god of wine, whom the Greeks incorporated into their mythology. It’s through the story of Orpheus (you remember him; he went to Hades to retrieve his wife Eurydice) that the tale of this drunken god is probably best known. The story didn’t end well for Orpheus. The Maenads, followers of Dionysus, tore his apart. Yup, gruesome. Author Ronesa AveelaPosted on April 21, 2015 December 12, 2018 Categories Books, Bulgaria, Events, Food, History, Holidays, Mythology and FolkloreTags artifacts, Bendis, Hercules, louvre, Maenads, Orpheus, Spartacus, Thrace, Thracians, wineLeave a comment on The Louvre Displays Ancient Treasures of the Thracian Empire – Who are the Thracians?